Save as much as 50% in monthly energy cost! Learn how your next HVAC system can pay for itself, and virtually cost nothing, just by making sure your current system is operating at its full potential. Elliott Heating and Cooling will ensure that all new installations meet strict guidelines to make your HVAC system run efficiently, using less energy. – Replacing your filters every month or as stated by the manufacture. – Have your coils cleaned on a regular basis. Make sure all of your duct work is insulated properly to prevent any heating/cooling loss. Make sure there are no air leaks around your windows and doors. If you have a chimney, make sure the damper closely tightly. 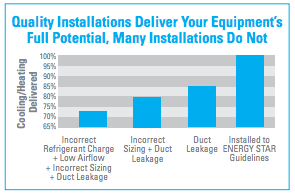 Making sure your current system was installed to Energy Star guidelines will make sure it is operating at 100% efficiency. By completing all of these energy saving tips you could potentially save as much as 50% in monthly energy costs. When adding up the monthly savings from these simple steps, you could pay for a new HVAC system in as little as 5 years.